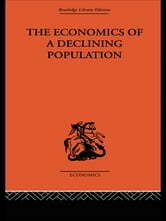 The economic consequences of changing demographics are of as much significance now as when this book was first published. The book covers not only changes in population size and age-composition, but also factors not included in the word 'declining' - such as increased life expectancy. Part 1 examines how estimates of future populations are made, and what the position is in the UK. It serves as a basis for Part 2, which discusses the developments in each of the more important parts of our economic life, without exaggerating the influence of the population factor.